The DS-MPE-DAQ0804 is a rugged, low cost data acquisition PCIe MiniCard module with both analog and configurable digital I/O. It is ideal for adding analog I/O and digital I/O features to embedded and OEM applications requiring low cost, small size, and/or light weight. The DS-MPE-DAQ0804 offers 8 16-bit analog input channels, 4 16-bit analog output channels, and 21 configurable digital I/O lines in a PCIe MiniCard form factor with an extended operating temperature of -40°C to +85°C. The analog inputs offer single-ended and true differential capability, 4 programmable input ranges, and 100KHz aggregate sample rate. Outstanding features of the DS-MPE-DAQ0804 analog input circuitry include an integrated programmable timer to control A/D sample rates automatically, resulting in precise timing plus significantly reduced processor overhead compared to software polling techniques. The 2048-sample data FIFO with programmable interrupt threshold further reduces processor overhead by reducing the interrupt rate required to transfer data from the board to the application. 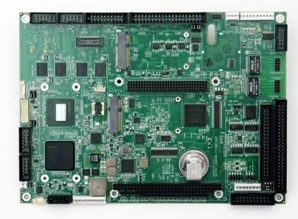 With these features DS-MPE-DAQ0804 can offer accurate, full-speed performance in any single-board computer regardless of processor speed. The 16-bit analog outputs offer 2 programmable output voltage ranges. An integrated precision, low-drift voltage reference ensures a lifetime of accurate performance across the full operating temperature range. A built-in waveform generator with 2K sample buffer enables the board to be used in stimulus applications such as sonar, laser light control, and other applications. The 21 buffered digital I/O lines feature programmable direction in groups of 4, 6, and 8 bits. The digital I/O lines can also be configured as either 24-bit pulse width modulators or 32-bit counter/timers, driven by the on-board 50 MHz clock. All I/O signals are provided on two miniature connectors, one for the analog signals and one for the digital signals. The connectors feature positive locking for maximum reliability in high vibration environments. Extended temperature capability (-40°C to +85°C) enables the board to operate in environments with extreme temperature swings, such as vehicles or outdoor installations. In addition, the board may be custom-configured with 0-ohm resistors in place of jumper blocks for increased ruggedness in high-vibration environments. Diamond's free Universal Driver software, included with the DS-MPE-DAQ0804, simplifies programming effort for all the board's I/O functions under both Windows and Linux operating systems. The DS-MPE-DAQ0804 product comes with the PCIe MiniCard hardware assembly, a cable kit with one analog cable and one digital cable, and a hardware kit containing mounting screws.